Melasma is a medical condition that is cosmetically troubling. It mostly affects the face, takes months to treat, and can easily recur. Because of this, our medical providers and aestheticians take a serious approach to melasma. Not only do we devise individualized treatment plans, but we also take the time to educate our patients about melasma triggers and prevention to prolong each individual’s treatment results. Melasma is a benign chronic hyperpigmentation disorder that causes dark blotches on the skin. This discoloration is caused by overproduction of pigment in the skin that is stimulated by certain triggers, such as sun exposure, hormones, and skin irritation. Melasma is most commonly seen on the face, but in rare cases can occur on other sun-exposed areas. About 90% of affected individuals are women. It is more common in individuals with darker skin tones. Melasma has also shown to be hereditary in some cases. 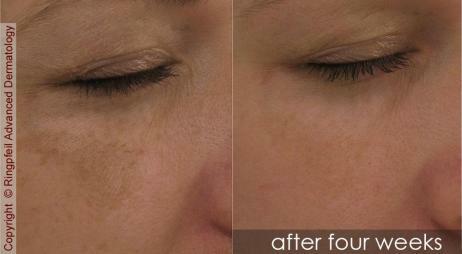 Even though melasma does not cause symptoms, treatment is often desired for aesthetic reasons. Our practice offers a large variety of products and procedures that aim to lighten and even skin tone. This variety allows our providers to devise customized treatment plans for each patient’s melasma. We also have the resources to create freshly compounded products with specific strengths of lightening ingredients tailored to each individual. Hydroquinone is a bleaching agent available in a 2% and 4% cream formulation. The 2% strength is available over the counter, while the 4% cream is only available in our office (Blanche ®) or by prescription. Hydroquinone is applied directly to the hyperpigmented areas of the skin twice daily for 4-6 months at a time. Usually a several month long break is necessary in between treatments. Retinoids are often used in melasma treatment to increase the skin’s absorption of bleaching agents. They also help to rid the skin of excess pigment by promoting cell turnover. Retinoids are available in different strengths and formulations. They can be received by prescription or purchased at our office (Refissa®). Azelaic acid is a prescription topical that targets and inhibits pigment producing cells. When used daily for a few months, it can effectively reduce hyperpigmentation and even skin tone. Koji Power is a serum that we compound freshly in our office. It contains kojic acid, lactic acid, and vitamin C. When used twice daily, these agents help to blend and even skin tone. They are applied to the entire affected area, rather than only darkened skin. Melanage Skin Brightening Cream is a customizable compound that we mix in our office. It contains vitamin A, arbutase, glycolic acid, and Green Tea extract. This combination of ingredients lightens the dark discoloration caused by melasma, gently exfoliates away superficial dark pigment, and may also calm inflammation in the skin. Best results are achieved with daily application for several months. It can be used as initial therapy, or as part of an aftercare skin regimen following a Melanage peel. Corticosteroids are prescriptions that help to reduce inflammation in the skin. If inflammation is the suspected cause of melasma, brief use of a corticosteroid can be helpful in reducing hyperpigmentation. Most of the above topical options are not covered by insurance. Prices available in office. Treating melasma is difficult but possible in most cases. You must meticulously follow a post procedure skin care regimen for life!!!! Glycolic acid peels can reduce the appearance of dark pigmentation from melasma by exfoliating the superficial layer of the skin. They involve little downtime or discomfort. A series of glycolic acid peels are most effective when used in combination with a series of microdermabrasion treatments every 2 weeks. The Melanage Peel is a potent chemical peel that is extremely effective in reducing the hyperpigmentation caused by melasma. It can be performed every 6-12 months and is followed by use of a daily prescription topical regimen for several months after the peel. For more information about glycolic acid and Melanage peels, please see our Chemical Peels page. Microdermabrasion gently exfoliates the top layer of the skin, which can reduce the appearance of hyperpigmentation. It is most effective for melasma when performed in combination with a series of glycolic acid peels every 2 weeks. For more information on microdermabrasion, please see our Microdermabrasion page. Picosure laser treatments deliver extremely short pressure waves into the skin that shatter pigment into small particles that are absorbed and discarded by our immune system. 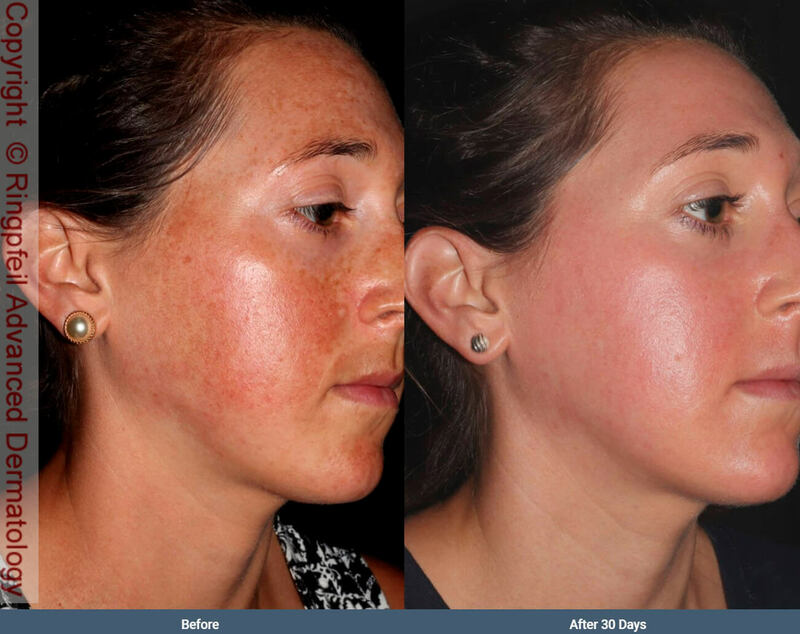 The Picosure laser is a unique treatment option for melasma because it does not produce heat. Without heat, there is no risk of causing inflammation in the skin and therefore no risk for triggering melasma. 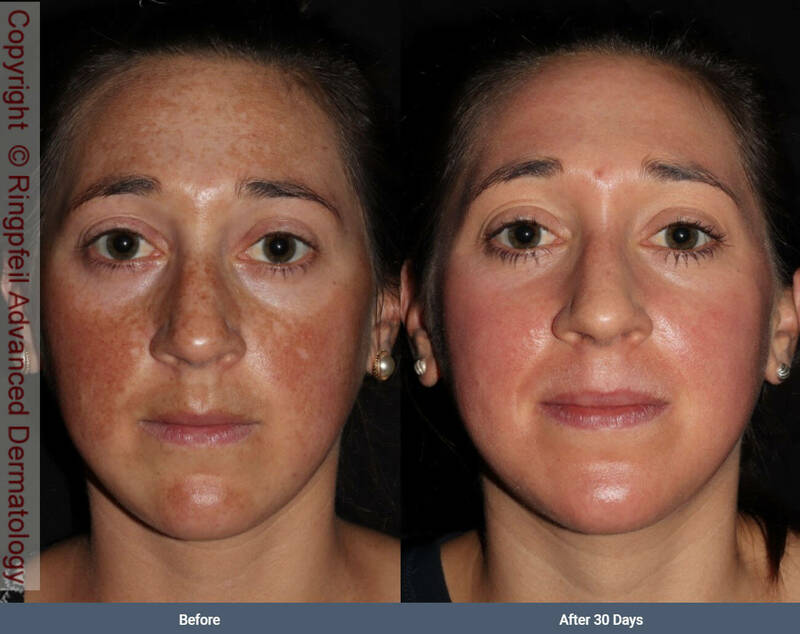 A series of these treatments performed 3-4 weeks apart can provide noticeable improvement in hyperpigmentation on the face. As stated above, sun exposure, hormones, and skin irritation are the most common triggers for melasma. Sun exposure is the most common trigger for melasma. This includes UVA and UVB light absorbed by unprotected skin. Hormones can trigger melasma in both women and men. The most common hormonal change in women that triggers melasma is pregnancy. In fact, melasma is commonly referred to as “the mask of pregnancy.” Menopause, hormonal contraceptives, and hormone therapies can also aggravate melasma. Skin irritation or inflammation can also trigger melasma. Irritating topicals, such as harsh soaps or cosmetic topicals, can cause inflammation in the skin that induces pigment production. Avoidance of triggers is the best prevention for melasma. We recommend the following steps to avoid triggers and worsening of melasma. Proper sun protection should be observed, including daily use of a facial moisturizer with SPF 30. When outdoors, a broad spectrum sunscreen with SPF 50 should be worn and reapplied every 2 hours. Sun protective clothing, like a wide brimmed hat, should also be used to maximize sun protection. Hormonal changes, such as those during pregnancy or menopause, are difficult to avoid. However, avoidance of certain hormonal birth controls may be beneficial in preventing melasma. Irritation in the skin can be easily avoided by following a gentle skin care regimen. We recommend washing and moisturizing the face with gentle, non-medicated products, such as Cetaphil, CeraVe, or Dove. Avoid hot water when washing the skin. Cosmetic products should be used with caution in melasma-prone skin, as some can be irritating.